Pumpkin as an ingredient in baking and cooking is extremely versatile and is easily stored for long periods. From pie to soup there is a savory or sweet flavor for all. Pumpkin is a vegetable of the squash variety and is grown by farmers around the globe. Pumpkin is rich in antioxidants, carotene, Vitamin A, and other complex nutritional benefits. Simmer engineers are always experimenting with both code and recipes in the kitchen and pumpkin season is no different. 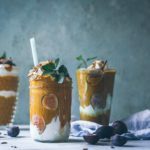 This pumpkin smoothie recipe recently became a seasonal favorite on our team. This smoothie is an excellent source of protein with 30 total grams. The recipe is also added-sugar-free, with a natural cooked pumpkin base. Cook pumpkin ahead of time and let cool. Optional: try your preferred brand of canned pumpkin, using only 1/2 cup and more milk. Add all ingredients to blender. Blend until smooth and creamy for about 60 seconds. Optional: For a creamier smoothie, add the banana. Brenda Sailsman is a graduate of the University of the West Indies Mona, published author and aspiring entrepreneur. She also happens to live in one of the most beautiful places in the Caribbean: Kingston, Jamaica, and is a social media maven. Brenda’s passionate about learning and sharing knowledge, and how those processes fit into our digital world today. If she had her way, extreme poverty worldwide would end, especially with the help of digital tools. Follow Brenda on Twitter @BeeAllison_.